When I started Just 4 Paws Pet Spa, almost 15 years ago, all I wanted to do was work with animals so I ditched the Corporate rat race and did it! I was a groomer, happily going about my days. Then, as time went on I began to learn more about the grooming industry and how it was much like the “Wild West“. You see, this is still an unregulated industry. This means that anyone can do this work without training. That’s the reason I began receiving more and more pets at my shop. They had either been hurt or traumatized at other grooming locations, including the big box retailers. At Just 4 Paws Pet Spa we provide “Gentle Pet Grooming you can Trust“. That’s who we’ve always been. This was never a novel concept to me. I just always felt that if these were my pets, I would want them treated with nothing but love, comfort and respect. My pets were always adopted, so they always came with a host of anxiety issues. I could never imagine leaving them with just anyone! So many of my clients can relate to this on a personal level. It’s why they come to us and why they continue to return. Over my 14 plus years of growing this business I’ve created the Just 4 Paws Pet Spa Philosophy through the help of these loving pets, my wonderful clients and my talented team of professional groomers. I’ve learned from all of them. Our philosophy is this: At Just 4 Paws Pet Spa we care about your pets just as much as you do. We become your pet’s guardian while they’re in our care. Above and beyond all else, we exist to help people help their pets. That is our mission and the foundation for all that we do here at Just 4 Paws Pet Spa and Academy. I founded Just 4 Paws Pet Spa in 2004. It started as a mobile service and expanded to become a highly sought-after pet spa store front where our furry lovies come from miles around to be groomed with specialized love and a gentle touch. I’ve assembled an amazing team of pet stylists, each professionally certified to ensure top quality care and service. As a Reiki Master Practitioner, I often work with pets that are anxious, aggressive and are often traumatized due to an abusive past. I am able to offer gentle, non-invasive care through this healing methodology. In addition to beautifying dogs and even a fair number of rabbits, cats are one of my specialties. Pet parents, many who call me “the cat whisperer,” travel quite a distance to have me work on their frisky felines’. Something I’m most proud of in my life’s body of work is the week I volunteered in Othello, WA in 2015 to help save an animal shelter in need. I was a groomer host for the reality show pilot “Animal House,” which helps save or create animal shelters in communities around the country. Also, in 2009 I provided grooming for rescue dogs featured on the Today’s Show, “Pet Makeovers”. From 2005-2010, I collaborated with the Hartz Mountain Corporation as the company revamped its grooming products and tools sets. I’m most proud of the purple and black slicker brush that they still retail on shelves today. I helped them design that brush.. In fact, I now buy that brush from them. My volunteer efforts also include providing love and spa therapies to needy shelter pets at the Animal Care & Control Center in NYC. The Just 4 Paws Pet Spa and Academy is our latest venture. I started this due to the overwhelming number of people asking, “Do we train?!”. So yes, now we do! Our Academy plans to elevate the grooming industry, starting with this small corner of the world, in Lyndhurst, NJ. 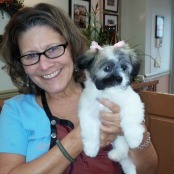 : Certified Pet Stylist I’m here at Just 4 Paws Pet Spa, because I believe in what we do here. We are different from many other groom shops, because we pay extra special attention to all the animals and make them our number one priority. I have personally seen first-hand how receptive animals are when we treat them with kindness. Their behavior changes entirely when you take the time to care. I believe that over the time I have been with Just 4 Paws, I have been able to build friendships with not only the pet owners, but with the animals themselves. Just 4 Paws Pet Spa is the best place to retire! After nearly 30 years in the corporate world I decided to take my career in an entirely different direction, knowing that pet grooming would allow me to embrace my affinity for animals and creativity. I went to grooming school and in 2011 became a Certified Specialist in “All Breed Dog Grooming.” Now my days are filled with wet kisses and wagging tails rather than staff meetings and reports. I am a loving pet parent to Milo, a ShiTzu/Bichon mix, and Sandya Shi-Poo. When I began working at Just 4 Paws in September of 2015, I had no idea I would be starting a journey that would change my life in such a positive way. At the time, I had just graduated from Montclair State University with a Bachelor’s Degree in Humanities and I was unsure of what I wanted to do with my life. One thing I knew for certain was that I always had the desire to work with animals from a young age. So, I decided to venture off into a field that had nothing to do with my chosen college major, because I knew animals were my passion. From my first day at Just 4 Paws, I knew I found the perfect career for me! I began as a bather and was quickly promoted to Erica’s grooming assistant. In the process, I became our Academy’s first unofficial graduate. Over the years I have spent at Just 4 Paws, I have been a “Jack of all Trades” so to speak. 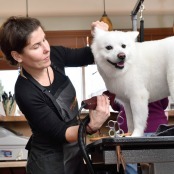 From Bather, to Groomer’s Assistant, to our Client Specialist, to the Executive Assistant for our Franchise; I have worn many hats at Just 4 Paws and have learned so much about the Pet Grooming Industry along the way. Now with our Academy launch, I can proudly add, “Assistant Director” to my repertoire of titles. My hope for the Academy’s future is that we send out a new wave of talented, loving, groomers who will inevitably raise the bar in the grooming industry. I’m so honored to be a part of something that will make such a positive impact on the grooming world. Just 4 Paws has been such a blessing in my life and I cannot wait to give back to the Academy by helping others achieve their dream of working with animals. I have been working with animals my entire life. 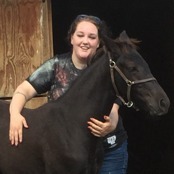 I grew up in a small town in Washington state and traveled across country with horses but luckily found my way to pet grooming! I have been grooming professionally for over nine years and training for five! Animals are my life and passion! I have gotten the opportunity here at Just 4 Paws to help other people learn to groom through compassion and understanding! Helping people and their pets is a dream come true for me and I am overjoyed to be able to share what I love with other like-minded people! 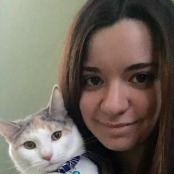 I joined the Just 4 Paws Pet Spa Team in 2015 and began working as a bather. I knew I found a special salon from the moment I began working here. Love and kindness is at the core of everything they do. 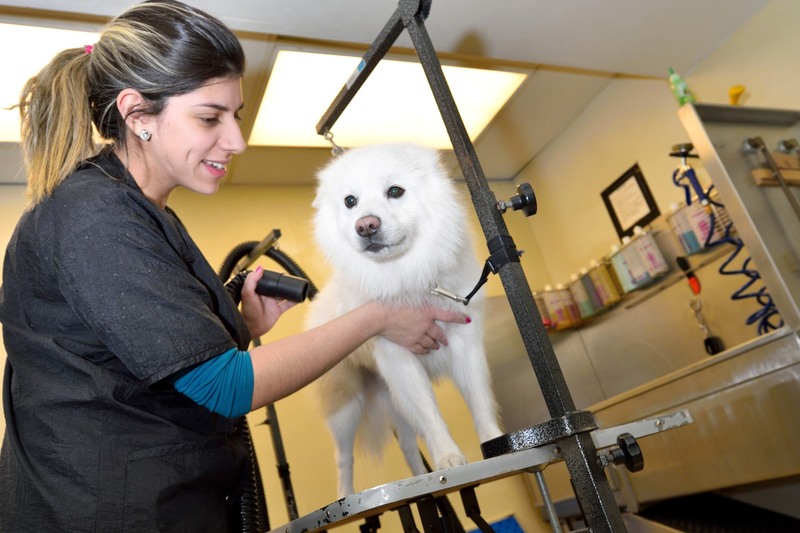 Seeing people so dedicated to the welfare of animals made me want to become a groomer myself. I had the opportunity to learn how to groom in-house at Just 4 Paws. Grooming is much more than a profession for me, it’s therapy. I am completely fulfilled with my profession, it’s the career I always dreamed of for myself! I’m able to work with animals, serve them and give them the security and comfort they need. Being a groomer at Just 4 Paws is the perfect way to spend my days!